This Shakespeare Reconstruction Sets 'Merchant' In Post-Civil War D.C. 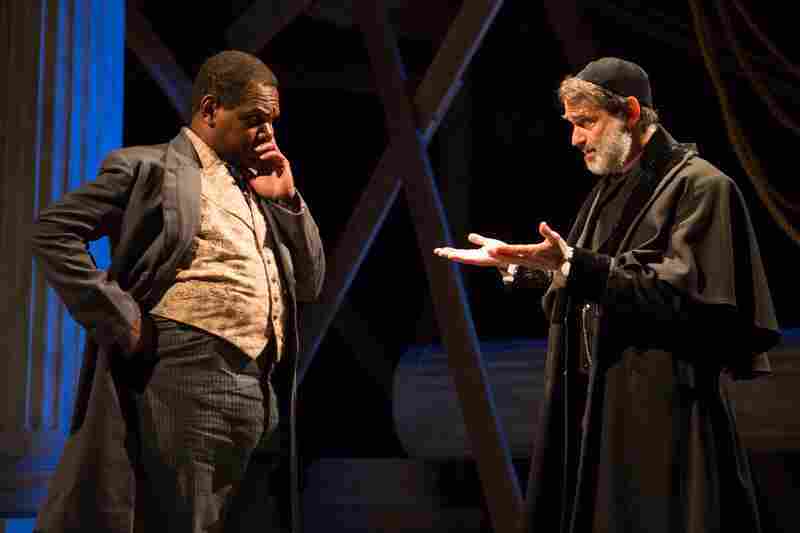 In District Merchants, Shylock is still Jewish, but half of the other characters are freed slaves. 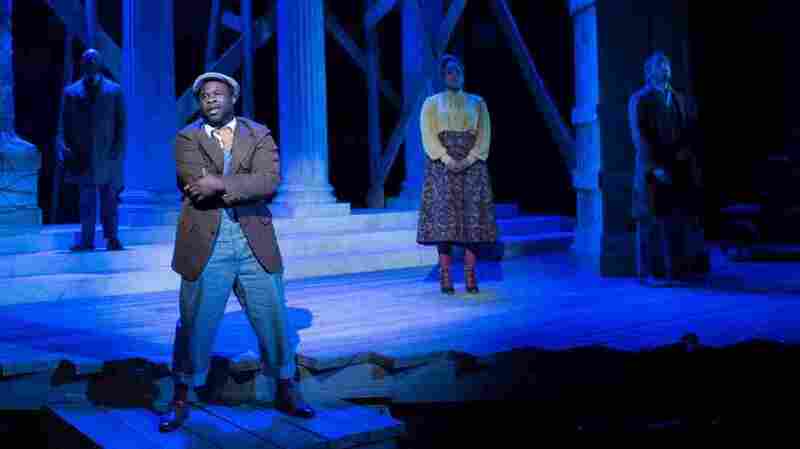 The playwright says he was inspired but a reference to slavery in Shakespeare's original text. In District Merchants, Akeem Davis plays Lance, a freed slave who has a crisis of conscience when he learns his boss, Shylock, may have been involved in the slave trade. My conscience says, "Launcelot, budge not." "Budge!" says the fiend. "Budge not," says my conscience. "Conscience," say I, "you counsel well." "Fiend," say I, "you counsel well." To be ruled by my conscience I should stay with the Jew my master, who, God bless the mark, is a kind of devil. And to run away from the Jew I should be ruled by the fiend, who, saving your reverence, is the devil himself. Certainly the Jew is the very devil incarnation. You get why The Merchant of Venice has been called anti-Semitic. On top of that, Launcelot is the play's clown and the monologue is meant to make people laugh. Hilarious, right? That speech just makes Aaron Posner shake his head. Posner has directed a dozen Shakespeare plays, many of them more than once. But he was never interested in The Merchant of Venice. "Too problematic," he says. He was, however, interested in the issues the play raises, like power, greed and moral ambiguity. To leave or not to leave? That is the question. I hate to say it, but the dilemma goes deep. So the question on which I am ruminating and cogitating at present is as follows: Does good service done for a bad master still count as good service? Or if I do good work for a bad master might I actually be doing bad in the world? And conversely-wise, if I do bad work for a bad master does that somehow make it good? And trickier still, how do I really know if he's really "bad" or "good"? Deep down. For actor Akeem Davis, who plays Lance, Posner has taken a mildly amusing Shakespearean monologue and turned it into something deeper and more relatable. "There's somebody quitting their corporate job right now because they feel like they're doing too good a job at ruining somebody's mortgage, you know" Davis says. "We can trick ourselves into thinking that our professional self is divorced from the personal self, but they are always one in the same." "Let them be free! Marry them to your heirs! Antoine (Craig Wallace, left) is District Merchants' Antonio, whose "pound of flesh" lender Shylock (Matthew Boston) is after. "It's a stark passage," Posner says. "He's really just saying, 'We own what we own.' " But Posner says that one little reference "just kicked something off in my brain." He wondered how the story would function in post-Civil War America. When he first started writing the script, he made Lance Jewish; then he realized it would be more interesting to make him a former slave. Posner says, "In a play in which I was asking questions about the relationships between blacks and Jews as these two underclasses in Washington at this time, it suddenly seemed more interesting, more dynamic, more fraught to have that be an African-American character. And then once he was African-American serving this Jewish master, it just sort of unwound itself from there." In rehearsals, the monologue also got Akeem Davis thinking. "What if the idea in that monologue dawns on Lance that he can quit?" Davis says. "This is a new thing. There had to be an adjustment period for when the Civil War was over and you just had to get use to the idea that, Well, I'm 5/5 now. Things are a little different now. How do I use this status for myself even in the face of opposition?" "It's part of what makes the Reconstruction setting so potent," Posner says. "It was such an opportunity — this amazing moment of possibility that went so disastrously wrong." District Merchants is part of a long list of Shakespeare adaptations, and yet, Davis says, there are still people who think the Bard's language shouldn't be tinkered with. He, of course, isn't one of them. "There are examples of what European artists have done with this text that can stand as the end-all be-all, sure," he says. "But I'm not interested in doing what Laurence Olivier did. I'm a kid from Miami: My Romeo is going to be different; my Launcelot's going to be different. The play has to resonate from your belly. You can't be trying to speak in 2016 like you think they would've spoken 400 years ago." And Posner says that's exactly what Shakespeare was doing: "Taking history, taking other people's plays, and coming up with a response." District Merchants is Posner's response to The Merchant of Venice. It's also an adaptation — and an entirely new play.